Readers of the Official Biography who own earlier editions have asked us how the new Document Volumes mesh with the eight biographic volumes, and why the byline of recent document volumes has expanded. Document Volumes from 17 are edited by Sir Martin Gilbert and Larry P. Arnn. They are based on Sir Martin Gilbert’s “wodges” of documents, compiled before his death, covering virtually every day of Churchill’s life. They are produced by Hillsdale College Press, where Dr. Arnn is editor in chief (aided by a very able team). The enormity of the task, as World War II reaches its climax, is suggested by the record size of volume 18. The following volume, covering eight key months from September 1943 to April 1944, will be no less comprehensive. Old and new document volumes are differently numbered. Sir Martin renumbered the new ones sequentially, so they will run consecutively from 1 to 23—much less baffling than the old nomenclature. He also retitled one biographic and several document volumes, eliminating the confusion caused by the three 1990s War Papers (Companions to Bio. Vol. 6.) Happily, the pagination is unchanged between old and new volumes. 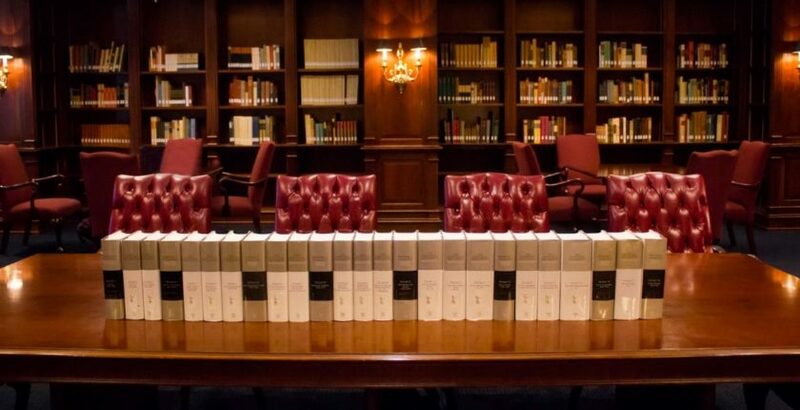 Here is a breakdown of the Hillsdale Biographic Volumes (bold face) and Document Volumes (with publication dates) in the order they appear on one’s shelf. The former Companion Volumes (CVs) are also noted. * There’s a little confusion here: Sir Martin ends Biographic Volume 6 with Pearl Harbor, and Biographic Volume 7 takes up from there with Churchill’s visit to North America in December 1941. Thus it is subtitled “1941-1945,” even though the documents for the last three weeks of December appear in Document Volume 16.